The health and well-being of our pets are things that truly concern pet owners, and Aikiou has developed products to help enhance your pet’s life. 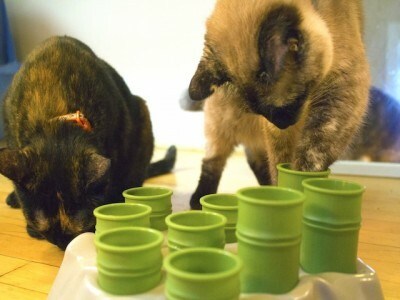 The Stimulo cat feeders challenge your cat to hunt for food. The feeder also helps to prevent food eating disorders such as vomiting and weight problems. The many different tubes and openings challenge your pet’s mind during their eating experience. Professionals agree that Stimulo pet feeders are one of the best solutions for bloating, overweight problems, and behavioral issues in cats. Their BPA-free cat feeder is a new and improved bowl that will have your cat thinking in order to eat. The health and well-being of our pets are things that truly concern pet owners, and Aikiou has developed products to help enhance your pet’s life. 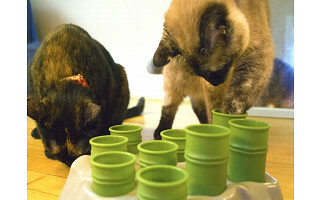 The Stimulo cat feeders challenge your cat to hunt for food. The feeder also helps to prevent food eating disorders such as vomiting and weight problems. The many different tubes and openings challenge your pet’s mind during their eating experience.